Facebook Live Series – ASK THE DOC: Alzheimer’s Research Today! This monthly series features short talks and Q&A with experts from the University of California, Irvine Institute for Memory Impairments and Neurological Disorders (UCI MIND), 1 of 32 congressionally designated Alzheimer’s Disease Research Centers in the nation. 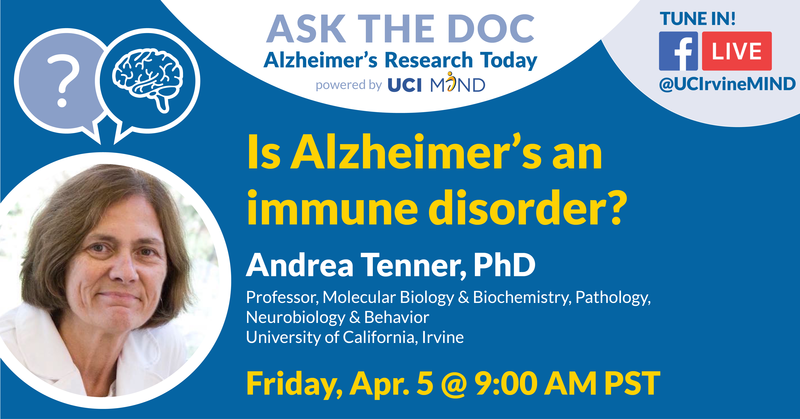 Join UCI MIND on Facebook (@UCIrvineMIND) the first Friday of every month from 9:00-9:30 AM PST to learn about advances in research to improve Alzheimer’s disease diagnosis, treatment, and prevention. Dr. Ahmad Sajjadi is Assistant Professor of Neurology in the UCI School of Medicine. Dr. Sajjadi received his medical degree from Tehran University of Medical Sciences in Iran and his PhD from the University of Cambridge in the UK. Dr. Sajjadi is a behavioral neurologist who sees patients with memory concerns and also conducts research on Alzheimer’s disease and atypical forms of dementia, such as frontotemporal dementia.